UKAEA Engineering Apprentices not only gain experience in their trade field during their 4 years, but also spend a 3-month period during their 3rd Year in a design office placement. Over the past 3 years RWE Nukem, who provide a Design and Consultancy Service on site, have taken 5 UKAEA apprentices and shown them the design processes and systems they use on a day to day basis. 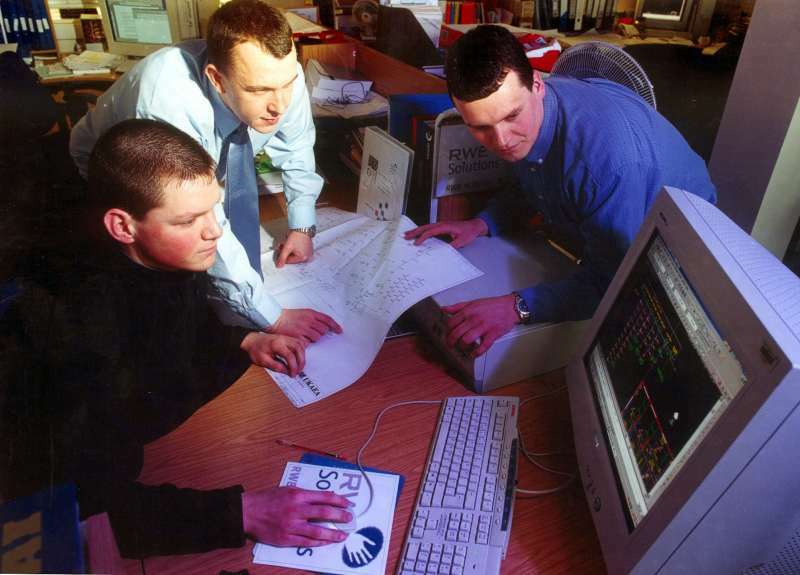 The apprentice learns numerous skills during his placement, including how the design office works, assembly drawings, circuit and wiring diagrams, installation and cable diagrams, as well as becoming adept in the use of CAD and different design techniques. The techniques and skills learned allow the apprentice to become more familiar with drawings in general, which will assist him greatly in his future career as well as being an important part of his SVQ Level 3 and HND in Electrical Engineering. Pictured with Sandy Mowat (centre) and Liam Sutherland (right) of the RWE Design Team is Graeme Tait a 3rd Year UKAEA Electrical Apprentice who is now completing his placement there. Graeme would like to thank the Design Team for their support and assistance over the past 3 months and explained "It's been great getting the experience of the Design Office here. It's different from the workshop tasks and means I have a better undertanding of the drawings when I am on a job"